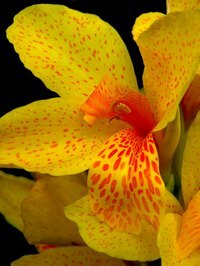 Canna plants are beautiful flowers that bloom from late spring through fall. They come in a variety of colors, such as red, pink, orange, yellow and white. The leaves of the canna plant have high-contrast stripes. Some growers of the canna plant even clip the flowers and display only the leaves. Given the right care, you can enjoy these plants year after year. Find an area with full sunlight and good water drainage. Cannas will grow in any soil type as long as the soil does not get water logged. If your location holds water, amend the soil to increase water drainage. Add compost, peat moss, ground bark or decomposed manure to raise the bed 2 to 3 feet. Dig a holes 2 to 3 inches deep. Space holes apart 20 to 24 inches for each hand-sized rhizome. Place the rhizomes into the hole with the nodes facing up. Use the leftover soil you dug earlier to fill the hole. Water immediately and generously. Be sure to soak the soil. After the initial watering it is important to keep the soil moist at all times, but do not let the soil become water logged. Watering twice a week should be sufficient. Feed cannas all-purpose fertilizer on a monthly basis. Be sure to follow the directions on the package of fertilizer. Cut canna flowers next to the the shoot once they have died or if you would like to use them for a floral arrangement. You should remove leaves that have yellowed. Dig up rhizomes before the first frost, and cut the stems down to 2 inches. Take care not to damage the rhizomes. Store the whole clump--with soil still around it--in a plastic container. Be sure to put them in an area such as the garage or shed to keep them from the frost. Do this in all USDA zones except zone 11 since temperatures can drop below freezing in these zones. If you live in a warmer climate, there is no need to store them in a frost-free area. The Canna plant will survive in a semi-dormant state. Plant the Canna rhizomes after the last frost in the spring.